Christopher “Chico” Ramirez (left) and chef Travis Lenig (right) of Field & Tides. Never say that chef Travis Lenig is lazy. On Monday, he and his business partner, Christopher “Chico” Ramirez, not only swung open the doors of new restaurant Field & Tides for the first time, but also rolled out the red carpet for a sizeable group of food writers two hours beforehand. That’s a lot to take on in a day, but it seemed to go well. The new restaurant is located at 705 West 11th in The Heights, in the little house that was formerly Zelko Bistro. There’s not a ton of seating in the dining room, but plans are already in the works to convert a nearby building into a dedicated lounge and cocktail bar, as well as extending the existing patio area. I first met Lenig in February 2015 at Liberty Kitchen during my search for Houston’s up-and-coming chefs, so it’s not entirely surprising that he now has his own restaurant. He met his business partner, Ramirez, while they both worked at Liberty Kitchen. Ramirez left before Lenig did to open The Boot, the unpretentious Cajun hangout also in The Heights. Regarding the long hours it took to get Field & Tides open, Lenig says the sacrifices of some behind-the-scenes players were key. “I could not have done this without the love and support from my family, especially my wife, Stacey,” he made a point of telling me. That’s a grounded statement from a chef whose food is equally down-to-earth. Field & Tides’ menu features simple, familiar ingredients. “This is the kind of stuff I make for myself at home,” he told reporters. That is not to say, though, that his approach doesn’t make the most of each element on the plate. 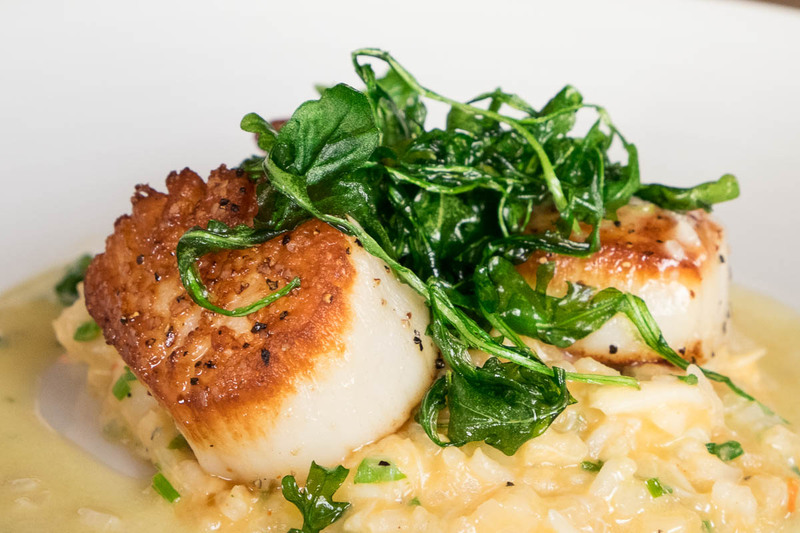 When a scallop is gorgeous, or duck confit is falling-off-the-bone tender, little more is needed than good companions both at the table and on the plate. 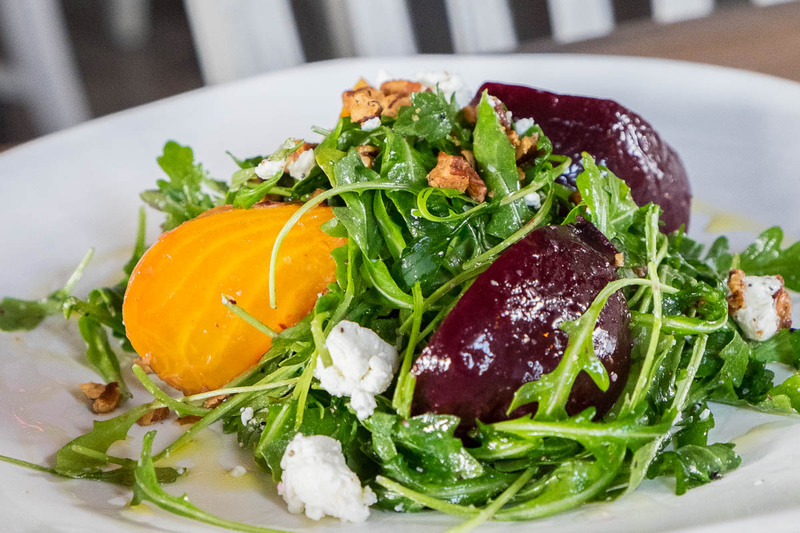 The first hit to sail out of the kitchen was a lush beet and goat cheese salad that thankfully livened up the ubiquitous motif with gold and red beet chunks hearty enough to require two bites each. I was so into taking photos of the staff and the fanciful antler light fixtures (a artful nod to the “Field” part of the restaurant name) that I let my pimento cheese fritter with strained pepper jelly sauce get cold. So, I’m not going to vouch for it, but just know that it’s there. I will, however, totally vouch for the duck confit. A whole leg quarter arrived on a bed of corn pudding that texturally fell somewhere between polenta and creamed corn. Unto itself, it was compelling and a remarkable companion for the duck. Collard greens stewed with top-notch Benton’s Bacon added a layer of texture while a dose of cane vinegar gastrique lent a bit of sweetness. It’s a remarkable dish. 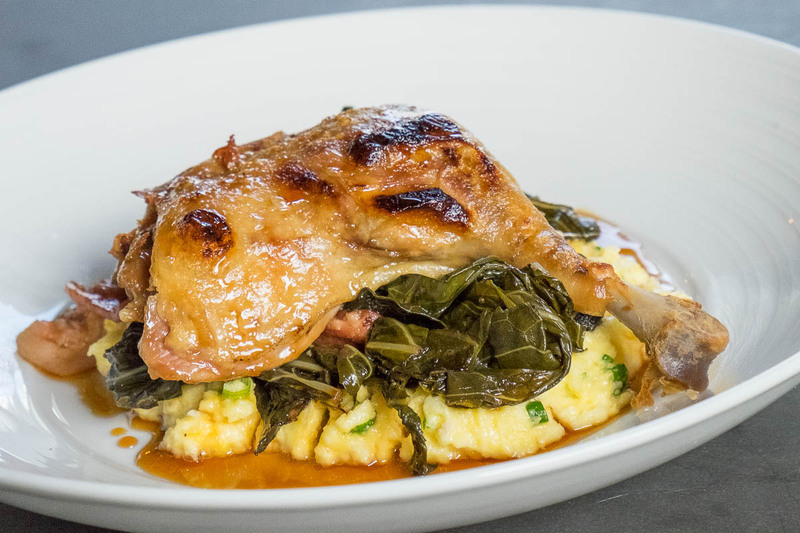 Like with the fritters and duck confit, the food here leans heavily Southern but there are peppery nods here and there to Asia and Mexico. The F&T Chicken “Wangs” comes with sambal glaze and cilantro garlic aioli, while the Potato and Peppers features guajillo chili-braised sweet potato along with sweet roasted peppers, crema, queso fresco and butter lettuce. As the name indicates, there’s a “Tides,” or seafood, side to the place, and those dishes rolled out of the gate just as pleasantly as the meatier ones. Those aforementioned scallops arrived on a bed of well-executed risotto livened up with shrimp and crab and richened with chive beurre blanc. 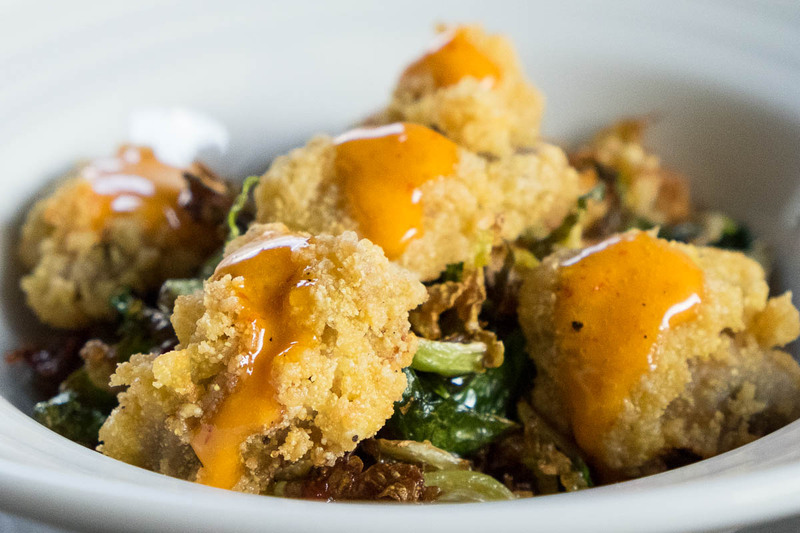 Oysters in a crispy cornmeal breading arrived on top of Brussels sprouts that had been shredded so as to get the most possible surface area a toasty brown. These were finished with a chili-honey glaze; exactly what was needed. Possibly the hit of the day, though, was the simple but perfectly executed big slices of chocolate “stack cake.” Born in poor areas of the Appalachian Mountains and the south, the story goes that since no one could afford a big, fancy cake, for celebrations each neighbor would bring over a single, thin layer. 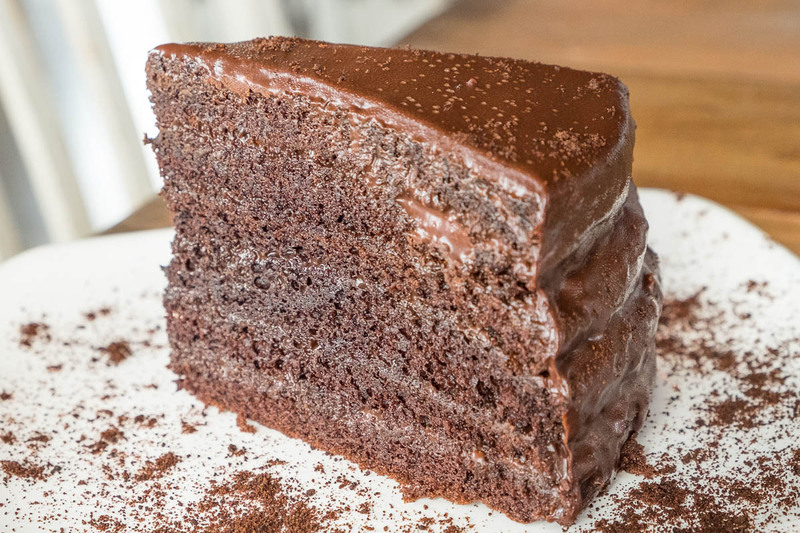 All would be combined in a stack cake, with the layers separated by humble ingredients like apple butter. Of course, in those days no one would have had the luxury of chocolate, so the Field & Tides version is fancied-up version of the original. That’s a change for the better, though. With all that food, there had better be something good to drink with it, and there is. Shawn Virene, Lenig’s brother-in-law and formerly sommelier of Brasserie 19, has put together a 34-bottle wine program and a Texas craft beer list, while beverage director Monique Hernandez (also formerly of Liberty Kitchen) is in charge of the cocktail program. The El Vaquero literally has the restaurant’s signature on it—a “FT” in chartreuse stenciled on top of the mezcal- and lime juice-based sour. 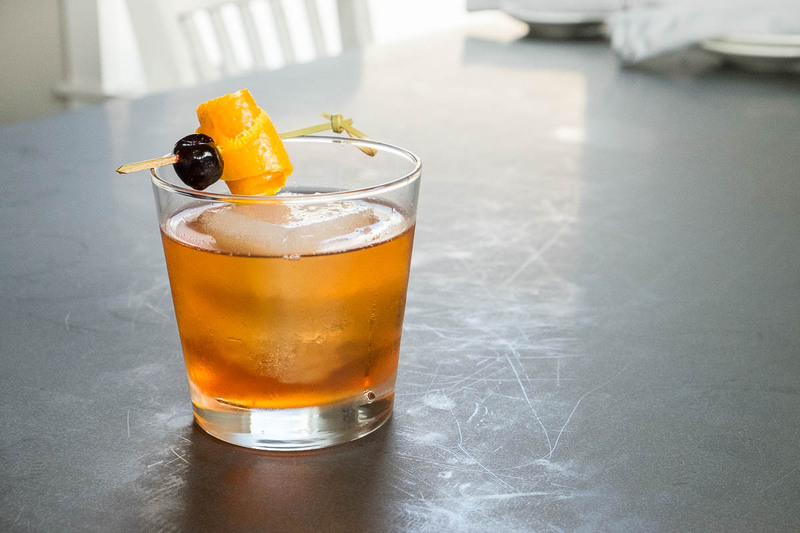 The First Cut, or the house Old Fashioned, is especially balanced, with Old Grand-Dad bourbon, turbinado syrup, orange bitters and Angostura. 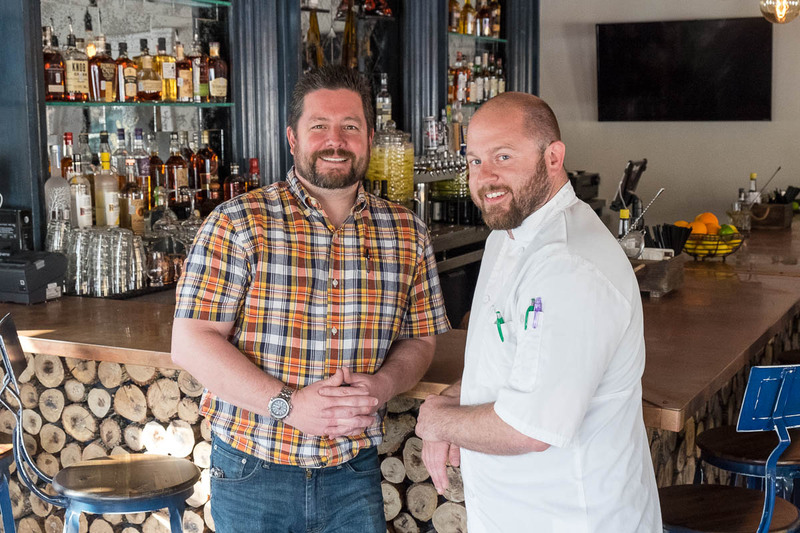 Fans of Helen Greek Food & Wine might see a familiar face, as their former bar manager Donnie Carroll is now the general manager at Field & Tides. Media tastings like this one always have to be taken with a grain of salt. Of course the restaurant is going to put its best foot forward. Of course the platings will be picture-perfect. That said, what Lenig and his staff have put together is an approachable menu that nonetheless seems to take nothing for granted. In my estimation, it’s well worth a try. Unlike other restaurants that tend to phase in brunch after a few weeks of being open, Field & Tides is offering it immediately. The menu is available online. Again, no one is going to accuse this crew of laziness. Diners who wish to try Field & Tides out for themselves can call 713.861.6143. The hours are 11 a.m. to 10 p.m. Mondays through Thursdays, 11 a.m. to 11 p.m. Fridays, 10 a.m. to 11 p.m. Saturdays and 10 a.m. to 10 p.m. Sundays.